Why is healthcare so expensive? One of the factors is the cost of medication. Patients are prescribed an increasing number of medications – increasingly to prevent future illnesses rather than to treat existing ones – and average medication costs appear to be rising. One of the largest medication classes in terms of sales is the antidepressants. A recent study indicated that 20% of women in the province of British Columbia had been prescribed an antidepressant in 2006. These medications tend to be expensive, in part, because more recently-developed medications are prescribed by physicians rather than older drugs that are no longer under patent protection. When a new medication is invented, it can be patented by the manufacturer. In Canada and many other western countries, drug patents last for up to 20 years, during which the manufacturer has the exclusive right to produce and sell the medication. Because the manufacturer has what is, in effect, a monopoly on the drug in question, prices tend to be quite high. For example, I recently priced the on-patent drug Pristiq at about $3.50 per tablet, whereas a generic version of Prozac (fluoxetine), the patent of which has expired, can be had for under $1 per tablet. Once a medication patent has expired, the manufacturer faces competition from generic manufacturers and the price drops sharply – as do profits. Consequently, companies that have one preparation on patent and one with an expired patent will tend to spend much more time, effort, and money promoting the medication with a patent. Pharmaceutical representatives will emphasize the patented preparation, and the industry-sponsored drug presentations will favour the single-source medication. In a recent survey of the most prescribed medications in the US by sales in 2009, the only antidepressants in the Top 200 were those still on patent protection. Well, good. If the newer medications are more effective, then let’s pay for them and help more people get well. So here’s a suggestion. Drug plans, both government and private, could agree to fully reimburse consumers for any antidepressant medication. If the medication is on patent protection or is otherwise more expensive than others, it should be fully funded. But there’s one catch. The manufacturer must demonstrate a systematic pattern of results indicating that the patented, more expensive medication is clinically superior to the cheaper alternatives. Isn’t that already the standard? No. All a new medication must show is that it is somewhat effective against a disorder. And even that criterion appears flexible or open to significant interpretation, given the approval of most antidepressants. It need never show that it is superior to other approved therapies. What would the impact be? Newer “copycat” drugs would no longer be put on the market for the sole purpose of maintaining an income stream for the pharmaceutical companies. Physicians and others would no longer be subject to the farcical contortions of detailers and conference presenters attempting to show how the new medication really represents a significant advance, contrary to the data. Governments and other funders would save a considerable amount of money. And sufferers would have no ill effects, if the older medications work just as well. If there is no fate, might there still be an advantage to behaving as though there was? One afternoon I went to the grocery store to get something for dinner. There was a good sockeye salmon run on the local river recently, and the store had salmon for half the usual rate. I went to the produce section. I usually despair at this point, having few good ideas for vegetables other than just steaming them and serving them beside whatever else I make. I picked up a bag of green beans, thinking I might stirfry them like my neighbourhood Szechuan restaurant does. When I got home I took down a Jamie Oliver cookbook for inspiration regarding the salmon. I often do this with a sense of futility, as the odds that I have all of the ingredients for any recipe are slim. The first page I turned to involved baking salmon with pesto (which I always have) over a bed of, you guessed, green beans. I do not personally believe that an unseen deity watches over me while I'm cooking, every so often tossing me a message (“Yes, you really are special - and here's what you can do with those green beans”). Coincidences may seem unlikely, but given an infinite array of opportunities for unlikely events to happen, we all experience at least a coincidence a day. So when I happen to run into an old friend on the street, or open a magazine at random to an article on something I’ve been thinking of posting about, my underlying belief system dictates: “This is just a coincidence. It has no particular meaning or significance to you; you can take advantage or ignore it, whichever you like.” If I followed this reasoning, I might smile at the friend and carry on with my mission – perhaps a trip to the stationery store. Logically, this makes little sense. At least to me. The reason I found the salmon recipe was not divine intervention. It was because I looked up “salmon” in the index. I don’t think that the superior outcomes of following “fate” demonstrate its validity. But living as though there was a such a thing as fate – as though the universe steps in to give you a hand now and then – enables us to take advantage of shifting avenues of opportunity and ultimately create a more interesting and less predictable life. No need to take up crystal-gazing, then, or devote one’s life to the vagaries of the I Ching. It seems fine to maintain a firm skepticism of the magical. But the art of the magician is best appreciated without trying too hard to see how the tricks are done, and life can sometimes be best appreciated by acting as though we believed in fate, even though we might not. Summer has finally arrived in British Columbia. It's late this year, and will be gone before you know it. 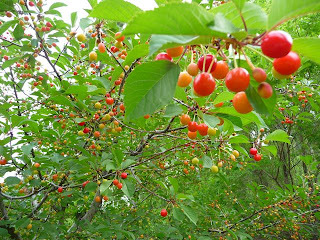 These sour cherries, for example, should have ripened and been picked already. Best not to wait. If we all have summer plans, let's get off the internet and go do them. Mindfulness is all the rage these days. Everyone seems to be trying to get more of it, and therapists are trying to train clients in it. One of the challenges in this effort is that it’s a bit tricky to pin down just what mindfulness might be. Given that we live entirely within the world of our own minds, entertained (during waking hours at least) by heavily filtered and interpreted input from the outside world, how could we be anything but mindful? I’m not going to attempt a definition here, apart from saying that most of the definitions I have encountered have multiple components: Mindfulness is characterized by a, b, c, and d.
One of the most recurrent elements in these definitions is a focus on the present, and it is this that many clinicians emphasize when they talk about mindfulness. One of the factors we deal with in therapy is extreme and ongoing negative emotion. People feel chronically depressed, anxious, fearful, guilty, angry, and so on, and want to experience a different balance of emotions. Some of us would like to eliminate some flavours altogether from the emotional ice cream shop. “I just don’t want to feel this anxiety any more.” This, regrettably, is impossible to achieve without death, which has unpleasant and unintended side effects (such as missing out on all the other flavours). But maybe a better balance of flavours is possible. One way of considering the potential benefits of a mindful approach is to localize the different emotions in time. So try it. Imagine that you can place your mind in three different time periods: Past, present, and future. You can replay any episode you like (or dislike) from the past. You can play any possible (even if very unlikely) scenario from the future, good or bad. Or you can attend to what is happening in the present, as you read these words in this room at this moment. Now let’s classify distressing emotions in terms of where your mind is when you feel them. Guilt. That’s an easy one. I may feel guilty in the present but when I do, my mind is playing a movie from sometime in the past. There was something I did or did not do that I know and knew then (or should have known) was a bad idea. Dread. Related to fear, but now I am all but certain that the awful event will take place, and that there is nothing I can do about it. Dread is always of the future. Anger. We generally feel angry about things that others have already done (past). Often we go from there to attribute those actions to their essential character (“that’s the kind of guy he is”), making it likely that the same transgressions will happen in the future. The point: When we are experiencing painful emotions, they are most often coming from our own minds – we are playing movies from the past or future and reacting to them. They are less often coming from our direct reactions to our immediate surroundings. In fact, if we can manage to set aside past and future and simply sit here in the present moment in this present setting, without overinterpreting things (“that wall is going to need painting soon and I hate painting…”), we often discover a sense of calm and peace. Yes, we have history. Yes, there are things we need to do. But life in this moment, even doing this task that I often find boring, is generally all right. There is a no-big-deal quality in the present that is always – or almost always – available to us if we develop our skills at being mindful. The word “mindfulness” opens a big can of philosophical worms. There is more to it than simply sitting in the present moment. But a big chunk of it involves reacting to what is, rather than to what was, or to what might be. If we can learn to do that just a little more often (we’ll never manage mindfulness 24 hours a day) we can find our peaceful anchor a little more easily. An exercise for keeners: Consider the full range of positive emotions (love, happiness, contentment, enjoyment, satisfaction, excitement, peace, transcendence, and so on). Consider where in time your mind sits when you feel each one. Some have elements of the past, others of the future. But notice the proportion of the experience that seems to emanate from the present moment, and whether this is greater or less than for the negative emotions.